Five years ago I offered some tips on pairing cigars with champagne. With New Years Eve a day away, now seems like a good time to update those tips with a half-decade worth of additional experience. Champagne can be fantastic, but unless you have unlimited funds, the vintage Dom Pérignon should be held back if you’re smoking a cigar. You pay a price for the champagne name (meaning it’s from the Champagne region of France). There are plenty of good champagne-style sparkling wines that can be had for a reasonable cost. Spending $50 or $100 on brand name French bubbly will probably be a waste (considering you’re going to lose some of the complexities due to your cigar). Spanish Cava, in particular, can be had for a fraction of the price. Champagne doesn’t have the heft of rum, whiskey, or even beer or coffee. 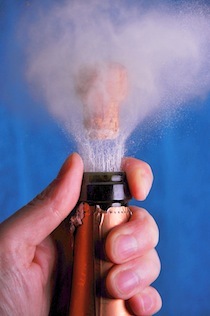 The best champagnes are the most subtle, so the same subtlety is needed in the cigar you pair with your sparkling wine. Stick with mild cigars that have balance. Too often Connecticut-wrapped cigars feature bitterness, so look for those with age and balance. Extra-aged Cubans can be a great pairing, and a special mention is deserved for the Illusione Epernay, which is named after the Champagne region and was blended with a champagne pairing in mind. Age your cigars and your champagne.